After a absence for a few years (sigh) it’s a pleasure to be back on the CLE calendar for the State Bar of Wisconsin. 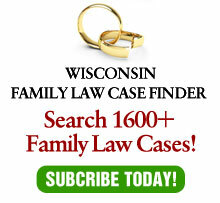 In particular, on January 11, 2013, I will be speaking with CPA Al Dassow of Clifton Gunderson LLP, Middleton on “Tax and Tax Fraud Issues in Family Law.” The live program will be at the State Bar Headquarters in Madison, with a live webcast and webcast replays on February 28, March 14 and April 26, 2013. Can the court order a party to sign a joint income tax return? Can a lawyer agree that a client not file a Community Property return even if none of the “opt out” provisions are applicable? Can a lawyer file a financial disclosure statement for a client if it is obvious that the client is not reporting all of his or her income? What innocent spouse relief is available for a client? Can a client plead the 5th amendment? Having just worked with Al on the other side of a major case, it is a pleasure to be working on the same side with him! He is incredibly knowledgeable and practical. The program should be good for 4 CLE credits and 1 EPR.